In September, Lana Del Rey made critical comments pertaining to Kanye West’s confounding new stance as an ardent Trump supporter. 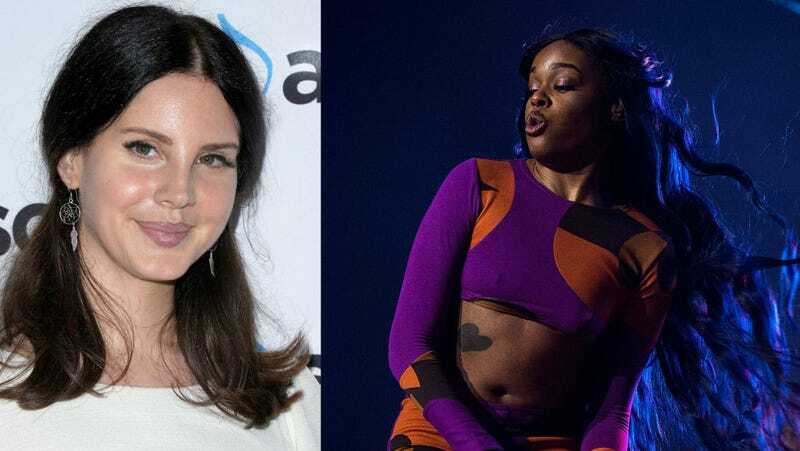 Then Azealia Banks criticized Lana for criticizing Kanye, and the melee ensued, with Del Rey goading Banks to meet her in person, since she had “the addy.” Today, the drama continues. This particular fight has felt a bit like an episode of AHS: Coven come alive, especially with the latest turn of events: Azealia insinuated that she’s going to use magic to set flame to Del Rey’s house, with the singer inside. Both girls have been known to have witchy predilections, though the success of either is arguable. I have yet to see any evidence of Lana Del Rey’s hex on Trump having worked; he seems just fine. Azealia famously uploaded video footage of the closet where she sacrifices her chickens, though the details of her spiritual practice are unknown. I have a friend who said that Lana Del Rey makes music for Moaning Myrtle, of the Harry Potter series, which is the best thing to come of this. Britney Spears appeared on Ellen and announced that she has a huge announcement, which she has yet to disclose. What if her next announcement is that she has an another announcement? And the announcement after that it is, similarly, an announcement of an announcement? She could do this forever, and I would literally follow, eagerly anticipating every announcement of the announcements to come.